S&P 500 is in a Strong UpTrend, But Over-Bought. 12/31/2017: Markets had a historic up move this year, with the Major Indices up more than 20%! Historically, Investment results are better if you “Buy & Hold” during a strong up move, instead of Trading the move. But If you are expecting the Markets to have another 20 + % gain in 2018, you could easily be disappointed. However it could be a great Trading year, and the Green Line Trading System could do very well. Trading works best with both Emotions (Fear & Greed) kicking in. Since Nov 2016, there has been little FEAR, as the Markets have not Returned to the Green Line since then. Markets have not corrected well, so the Money Wave Buy Pops have been small… This will eventually change, as the liquidity of 8 years of FED Printing is gone, and now the FED is Raising Interest Rates. Historically with a Strong Economy there will be Rising Interest Rates and Inflation. 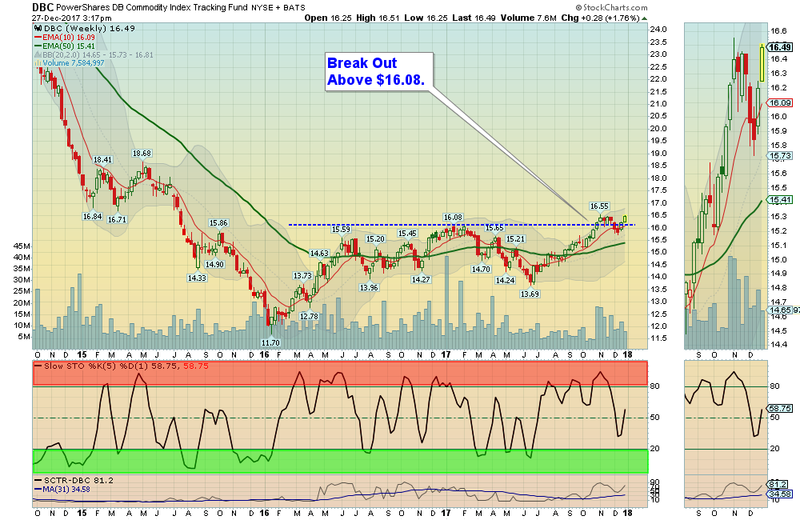 There are many Investments (ETF’s & Stocks) that should do very well with this environment. Many Sectors such as Copper, Coal, Oil, Rare Earth & Steel have started up now from long Bear or Down Markets. But the Volume has not been there to confirm good Break Outs (most do not Believe). We want to see how these hold up when the Major Markets return to their Green Lines. Money eventually Flows to better Value (to where Tammy is not). Crude Oil was up 3,34% for the week at $60.42, and GOLD was up 2.39%. MONEY WAVE BUYS SOON: We are currently in 2 logged Open Positions, for the Short Term. There are 5 Investments on the Short Term Watch List, so be patient and WAIT for Green Zone Buys! DBC COMMODITY FUND Relative Strength is back Below 90. GRPN GROUPON INC. Wait for Break Out above $5.99 on High Volume. JJC COPPER FUND Wait for the next Green Zone Buy on the Daily Chart. KOL COAL FUND Wait for the next Green Zone Buy on the Daily Chart. LL LUMBER LIQUIDATORS Relative Strength is Below 90. REMX RARE EARTH FUND Wait for Green Zone Buy on the Daily Chart. TWTR TWITTER INC. Wait on Break Out Above $25.25. UGA US GASOLINE FUND Volume is too low… Break Out Above $33.07. VALE VALE DE RIO Wait for the next Green Zone Buy on the Daily Chart. Alert! Market Risk is HIGH (Red Zone). The probability of successful Short Term Trades is lower, when the S&P 500 is Way Above the Green Line. Even the Strongest Funds can get chopped up. 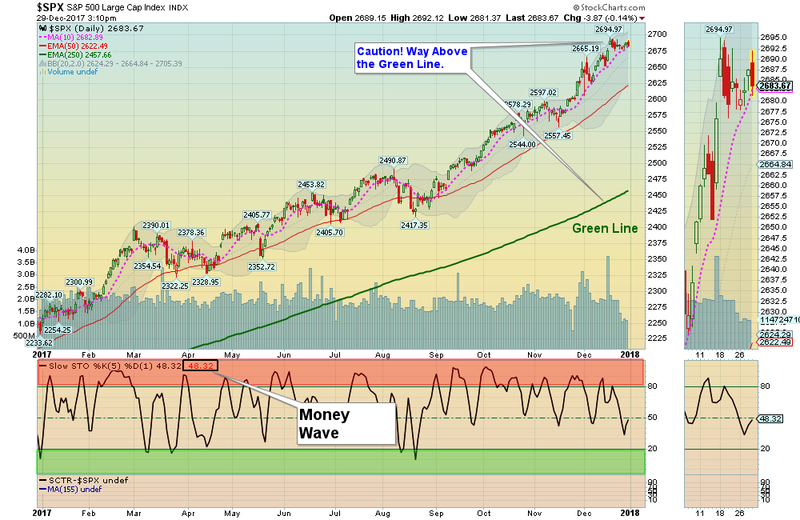 Either take quick gains from Money Wave Pops, or STAY IN CASH & WAIT for a larger correction. 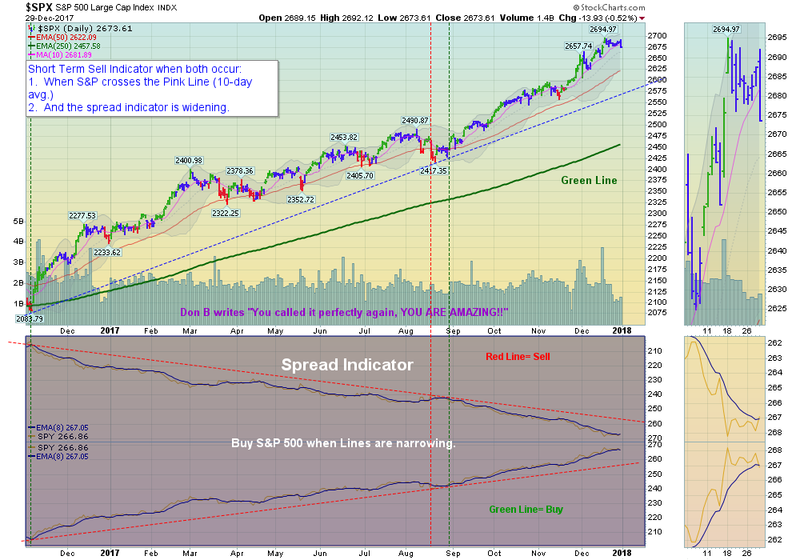 S&P 500 is Holding just Above the Pink Line. Markets are down slightly today on more slow holiday trading. The S&P 500 is holding just above the Pink Line of 2682 (10-day avg.) to avoid a Short Term Sell Signal. The Mutual Funds want to hold the Markets up to get bigger bonuses. You will have to WAIT for more Money Wave Buys. When the Markets pull-back, try to Buy Investments that recently made new Highs. Crude Oil is up today at $60.25, a New High. INTC INTEL CORP. Money Wave Buy today. We will not log INTC, as the Volume is below average. Please be patient and wait for Money Wave Buys soon. We will email you when they are ready. Click on Watch List. EXIT BOTZ ROBOTICS FUND if it is going to Close below the Pink Line around $23.70. It’s Cold! Please Keep Warm. Markets are up slightly today on slow holiday trading. The Mutual Funds want to hold the Markets up to get bigger bonuses. You will have to WAIT for more Money Wave Buys. The major Indices are still holding above their Pink Lines (10-day avgs.) to avoid Short Term Sell Signals. Crude Oil is up today at $59.90. Money Wave Buys soon for INTC INTEL CORP, MU MICRON TECH, NTAP NETWORK APPLIANCE, RIOT RIOT BLOCKCHAIN & TWTR TWITTER INC. Please be patient and wait for Money Wave Buys soon. We will email you when they are ready. Click on Watch List. 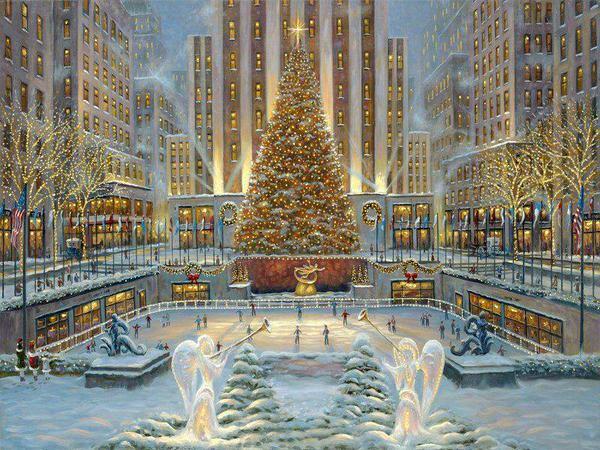 Markets were mixed today on more slow holiday trading. The Markets won’t drop yet, so there are very few Money Wave Buys. (Please WAIT). The major Indices are still holding above their Pink Lines (10-day avgs.) to avoid Short Term Sell Signals. Pajama Boys are in control this week, and love to BUY. Crude Oil is down today at $59.65. Money Wave Buys soon for NTAP NETWORK APPLIANCE & RIOT RIOT BLOCKCHAIN. Please be patient and wait for more Money Wave Buys soon. We will email you when they are ready. Click on Watch List. EXIT GRPN GROUPON Inc. if it is going to Close Below Support of $5.17. The DOW is the Strongest Index now. Markets were down slightly today on slow holiday trading. 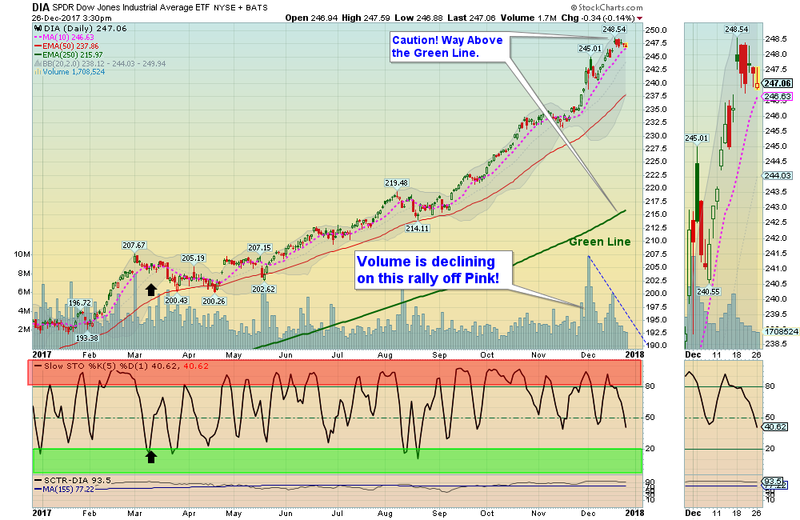 Money Wave bounces are poor, and the Volume is Low. The major Indices are still holding above their Pink Lines (10-day avgs.) to avoid Short Term Sell Signals. Pajama Boys are in control this week, and love to BUY. Most Leading Investments are in the Red Zone (probably too late to Buy for the Short Term). Please have Sell Stops below recent Short Term purchases. Crude Oil is up again today at $59.90, a New High. EXIT MRVL MARVELL TECH if it is going to Close Below your Buy Price, or $22.00. EXIT ADMS ADAMAS PHARM. if it is going to Close Below your Buy Price, or $34.27. EXIT SMH SEMICONDUCTOR FUND if it is going to Close Below your Buy Price, or $98.45.